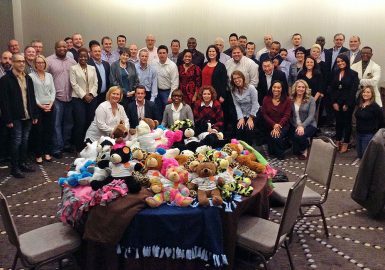 Bears and Blankets is one of our We Care for Kids™ programs, a wonderful collection of team motivational activities for charity, which create immediate, tangible results while boosting employee morale through the building and donation of memorable items for children in need. Bears and Blankets features Apple iPads® delivering a unique teambuilding experience involving text, audio and video clues, exciting gaming challenges, and the ability to capture and save all your memories of this truly heartwarming event with photos and video of your teams in action. 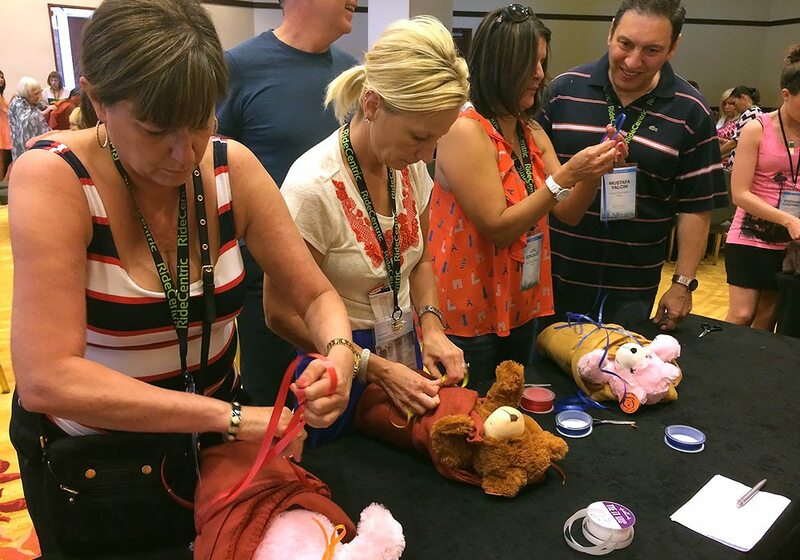 During the event, as teams earn points they will be choosing their bears and carefully stuffing them to huggable perfection. Bear-size t-shirts are skillfully designed and decorated by the artistic members of your group. Once these furry friends are created, they are dressed in their custom shirt thus giving them an identity all their own. In addition, each team will use their creativity to swaddle the bears with warm soft blankets. These blankets will help promote an added sense of security for the children receiving them. 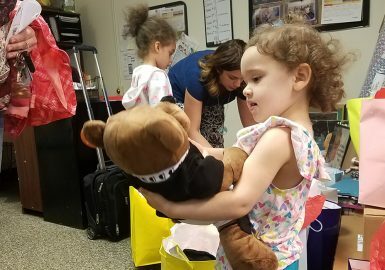 All the items made will then be delivered to crisis centers and law enforcement agencies that will distribute them to children who have experienced trauma. Whenever possible, a representative from the organization receiving your gifts will address your group and thank them for their generous donation. The possibilities are endless but the outcome is always the same: a proud team of employees helping children to know someone cares. To ensure a great experience, aspects of these teambuilding activities may be modified for your group size, group makeup, time available, and other variables. 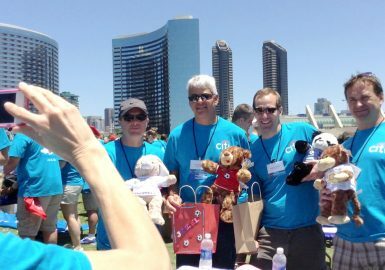 Our Bears and Blankets team building program was all about bringing our group together and doing something for charity. The whole event was enjoyable. It was well organized and your lead facilitator was great! Our event was super organized and your lead facilitator was awesome to work with! The best team building aspect of the program was the iPad challenges but the whole thing was fun - everyone had such a great time making the bears! I would like to thank you all for coming through for us at the last minute and pulling this off! It was such an impactful and amazing experience and all the associates LOVED it! I have received nothing but positive feedback from our staff. Everyone enjoyed themselves immensely. You made the time pass by very quickly and most of all FUN. You are an incredible host and I thank Best Corporate Events for making our event a success. 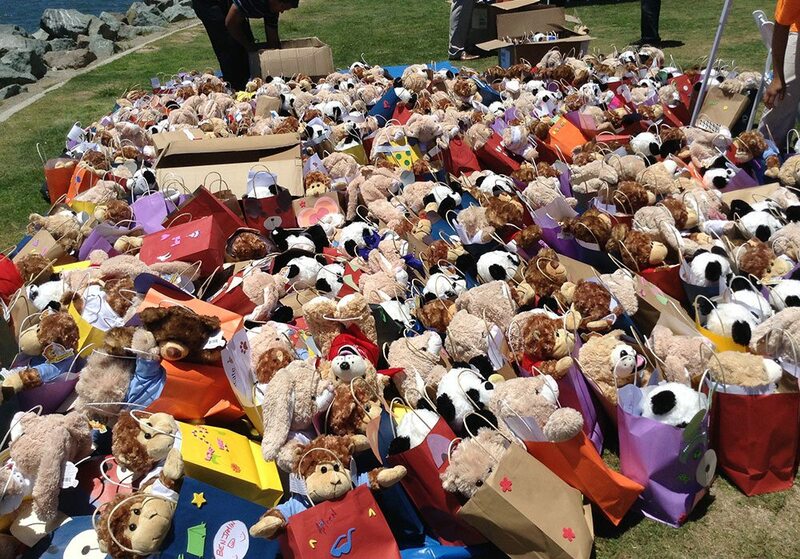 Thanking you from the “Beary” bottom of our hearts. Thank you for doing such a phenomenal job with our group. 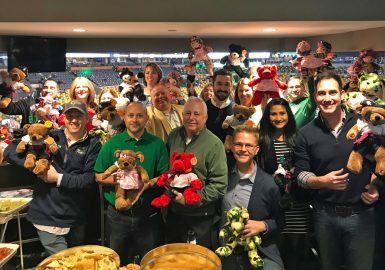 Bears and Blankets was an event none of us will forget. I look forward to working with you again. We will definitely keep you in mind when our clients need community events. Having the Bear program at our corporate event was a HUGE hit! Our clients and partners were engaged and loved creating the stuffed animals. This was our first time attempting to do a charity event during our conference and the feedback we received was amazing. This is definitely something we will plan on doing for our next user conference. Your team was lovely and we were thrilled to have had them guide the group and be so helpful. Thank you so much for helping us make our event a huge success!! We will be in touch next year as well. 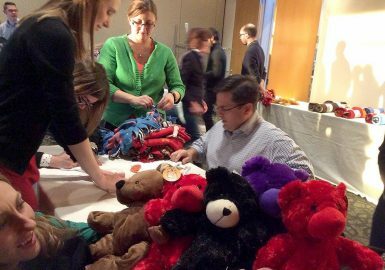 Our Bears and Blankets program was extremely organized. The icebreaker got the group energized and laughing together. The most fun were the questions and competition to earn points. They loved the charitable aspect and having a representative from the organization speak to the group was very impactful. Watching everyone design their t-shirts for the bears after learning the reason for the activity was fun. It became a competition for some tables to have the most creative and cheerful shirts. I think they really enjoyed the program. There were lots of Selfies and smiles going around when showing off their bears. It was a fun event! Our Bears and Blankets program was very well organized and it was fun taking photos throughout the event. The best team building aspect of program was using the iPads to have interaction among team members. Everyone enjoyed it. 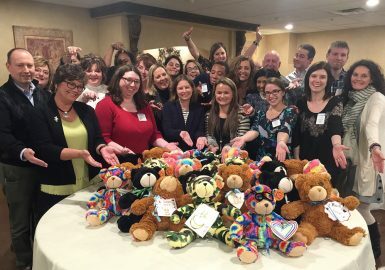 Our Bears and Blankets program was very organized! Everyone at your company was extremely responsive and helpful. The energy in the room was very positive and everyone seemed to really enjoy themselves. The entire program was fun especially and the cookies on the face which was really funny. As for the activities and charitable aspect of the program, they loved it! Our Bears and Blankets program was extremely organized and your lead facilitator was …AH MAZING! The icebreakers were really fun and executed perfectly. We always love to give back to our community and to give back while having fun doing it, was the icing on the cake. I would highly recommend your company and you will be seeing us at IGT again soon. Huge success!